Over the many years they worked together, most of the John Ford/John Wayne collaborations involved Westerns. They occasionally branched into different genres, though, and 1945�s They Were Expendable offers one of those detours. Set immediately following the attacks on Pearl Harbor and the United States� entry into World War II, US PT boats patrol the seas off of the Philippines and occasionally battle the Japanese. Deemed too light to offer military value, Navy administrators don�t like these vessels, so their crewmembers get left without much to do. Into this environment steps Lt. John "Brick" Brickley (Robert Montgomery) takes charge of Motor Torpedo Boat Squadron 3. Along with fellow seaman like Lieutenant (JG) "Rusty" Ryan (Wayne), Brickley commands the PT boats in an attempt to stem the Japanese invasion of the Philippines. Expendable arrived at an interesting time in history. Since it came out in December 1945, it qualifies as a �post-war� movie, but just barely. Actually, it probably shouldn�t be seen that way because production took place while combat continued. Expendable went before the cameras in the first half of 1945, months before the Japanese surrendered. By the time Expendable hit screens in December, it no longer served the propaganda purpose that came with so many wartime films, but it still feels like part of that tone. It wouldn�t be long before movies started to examine the dark side of the war � the downbeat Best Years of Our Lives would hit screens in 1946 � but Expendable meant to accentuate the positive. Which seems perfectly fine, of course � I don�t intend to convey the belief that Expendable needed to be darker or less patriotic. It definitely feels like a �time and a place� movie, though, one that may have looked very different if it�d been made even two or three years later. As I watch Expendable, I don�t object to its �war-time feel� � I have no issue with that. However, I do find it hard to swallow the movie�s slowness, as the tale tends to be turgid and plodding. Honestly, Expendable takes about 75 minutes of material and stretches it to 135 minutes. This means long periods in which almost nothing happens � and it also leaves us with one of the most gratuitous romances committed to film. A large patch of Expendable explores the romance between Ryan and nurse 2nd Lieutenant Sandy Davyss (Donna Reed). Tedious and tacked-on, these sequences serve no purpose other than a potential appeal to the female part of the audience. Wayne and Reed show no chemistry, and these moments actively torpedo a long segment of the film. Not that it zings during other periods. Much of the film focuses on the men as they� well, as they don�t do much of anything. It develops the characters in a rudimentary manner but a lot of the story feels stuck in neutral. Expendable does come to life during the occasional combat scenes. These offer a strong sense of verisimilitude, and they prove to be quite exciting. When the tale veers toward action, it becomes a winner. Unfortunately, those scenes don�t account for much of its running time. Instead, we�re stuck with a slow story about lackluster, anonymous characters. I admire many involved with Expendable, but the end result leaves me mostly bored. 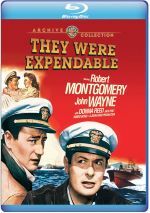 They Were Expendable appears in an aspect ratio of approximately 1.37:1 on this Blu-Ray Disc. As usual, Warner Archives produced a strong transfer. Sharpness usually looked solid. A few interiors came across as a bit tentative, but those remained a minor distraction. Most of the flick boasted positive accuracy and delineation. I saw no shimmering or jaggies, and edge haloes were absent. Print flaws also failed to materialize, and black levels looked great, as the movie came with dark, deep tones. Shadows were smooth and clear, and the film offered strong contrast, with a nice silvery impression. I felt very happy with this appealing image. Though acceptable for its era, the movie�s DTS-HD MA monaural soundtrack showed its age. The main problem came from occasional instances of mild distortion. Nothing severe occurred, but I heard a bit of edginess through the film, usually alongside louder elements. Audio quality seemed passable. Speech was easily intelligible but could be on the thin side. Music appeared somewhat shrill, and effects appeared similarly trebly, so don�t expect much dynamic range here. This became a passable mix. Don�t expect extras here. We get the film�s trailer and that�s it. When They Were Expendable focuses on action, it provides a lively affair. Unfortunately, too much of the film concentrates on trite, dull character moments, and these make the end result mediocre. 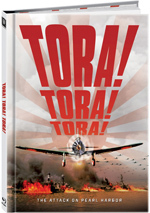 The Blu-ray delivers very good visuals along with adequate audio and next to no supplements. I want to like Expendable but the film leaves me cold.